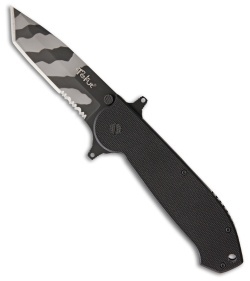 The Tekut Ares B folding liner lock knife is a large tactical knife ready to be put to the test. The partially serrated tiger stripe titanium nitride coated tanto blade can be deployed with the flipper tab that doubles as hand guard or the ambidextrous thumb studs that act as a blade stop when open. Textured black G-10 scales provide an excellent purchase on the knife and with a reversible stainless steel pocket clip, it can be carried tip-up or tip-down. Includes black nylon belt sheath.